Triad Event Lighting had the opportunity & pleasure to work with two awesome people, Christelle & Trent, on their intimate wedding celebration at the Ritz in Uptown Charlotte, this past weekend. From the very beginning, Christelle knew what she wanted, and it was our job to help bring her vision to life…. 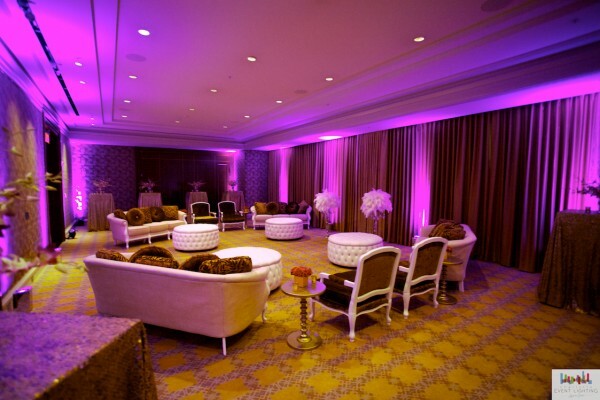 Radiant orchid & gold uplighting coupled by remote controlled pin spotting, really transformed the already gorgeous space which made the rooms pop with excitement and not to mention create that serious “wow factor”… which is exactly what our bride wanted. Of course, when creating a certain look, it takes a team of professionals, so we wanted to take time and acknowledge them.